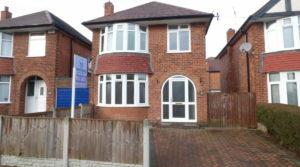 Merchants Property Services are pleased to offer this well appointed 3 Bedroom detached property. The accommodation briefly comprises of a Hall way leading to 2 spacious reception rooms with Laminate flooring. To the rear of the property is a modern fitted kitchen. To the first floor are two large double bedrooms with fitted wardrobes and one single bedroom. The property benefits from a modern white bath room suite with electric shower. The property is in excellent decorative order with neutral colours throughout. The property is double glazed throughout with gas central heating .There is a manageable front garden with block paved driveway for two cars. To the rear there is a private enclosed rear garden with a large patio area and lawn. The property is in an ideal location with excellent schools close by.